Yesterday was my husband’s 69th birthday (and by the way – he is MUCH older than I am!) 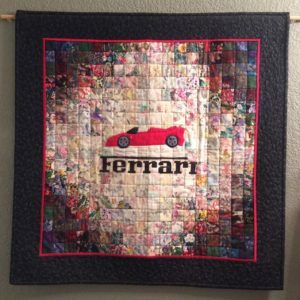 so in honor of him I thought I would share a few car quilts with you. 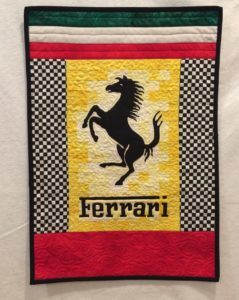 I have made these for him in past years trying to combine his love for cars with my love for quilts. Just to explain a little, he is not only a car guy who loves cars, he was fortunate enough to let his passion also be his vocation. For 40 years, he owned a car dealership here in Denver and sold and serviced high end cars like Ferrari, Bentley, Rolls-Royce, Maserati, Lotus and a few other franchises through the years. The first quilt is one that I made for him shortly after we got married in 1998. 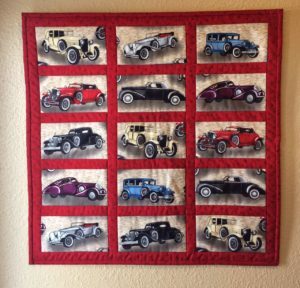 I guess I was going through my “watercolor” phase of quilt making and I thought he should have a watercolor car quilt. My applique skills were a bit lacking but this was supposed to look like an F50 model of Ferrari. At least he loved it anyway. The next one I made during my year of Heather Thomas’ color class. We were studying Luminosity and I tried to illustrate the light shining behind the horse. I also added the green, white and red from the Italian flag as well as black and white checks for the Winner’s flag. Sometimes it is good exercise to just have fun making a new creation. This last quilt was the result of me dragging him into another quilt shop while we were out of town. I can’t tell you how many car shows and auctions I have been “privileged” to attend with him so it only seems fair that he got to experience the quilting world occasionally. Well on this particular expedition he was wandering around and found a great fabric with vintage cars, which are his favorite. He especially liked the Bugattis, Dusenbergs and some others. He was happy to have them made into plain blocks and set with red sashing. Sometimes the fabric works for us and makes it so simple. Just for You – Quilt Quote: “Ask not what your fabric can do for you, but what you can do for your fabric”.